In partnership with UNICEF, this project aims at outreaching children across Lebanon providing them with Basic Literacy & Numeracy, Early Childhood Education, and Retention Support programs. The project’s main purpose is that all children, especially the most vulnerable ones, are provided with equal access to educational opportunities aiming at reducing the chances of dropping out of formal schooling and with an attempt at increasing school retention rates. It will serve 26800 children over a time period of 12 months. The USAID-funded QITABI project aims to expand equitable access and improve learning outcomes for vulnerable students in Lebanese public schools. The project is led by World Learning in partnership with Ana Aqra Association, Management Systems International (MSI) and AMIDEAST. QITABI consists of three components of which Ana Aqra Association is involved in Component One: Improving reading outcomes for primary level public school students. Component 1 focuses on improving early grade students’ reading skills in the Arabic language in 260 primary public schools, grades 1 to 4. QITABI’s approach includes conducting Early Grade Reading Assessment (EGRA) Baseline and implementing two-year Early Grade Reading (EGR) Intervention based on Balanced Literacy Approach. The project’s EGR intervention includes capacity building of DOPS monitors, CERD master trainers and training/coaching of around 960 primary teachers by providing day-to-day support through the project’s Early Grade Reading (EGR) facilitators, in addition to holding parental/community awareness Reading activities. 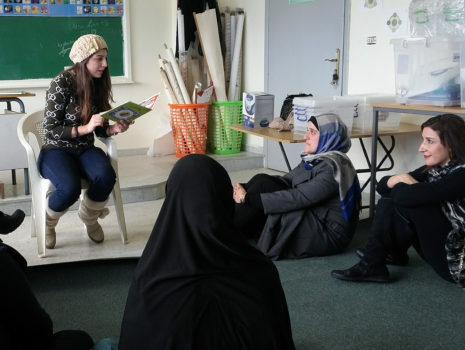 QITABI’s intervention in public schools provides key resources including educational materials such as carpets, flip charts, audio system, and bookshelves, and classroom libraries composed of read-aloud and leveled reading books for grades 1-4 to impact reading instruction and learning for 19,200 students. The effectiveness of the project activities is reliant on the presence of strong institutional systems within MEHE to ensure sustainability. Activities under this component will strengthen MEHE’s capacity to monitor education services, design, and oversee reform efforts effectively.